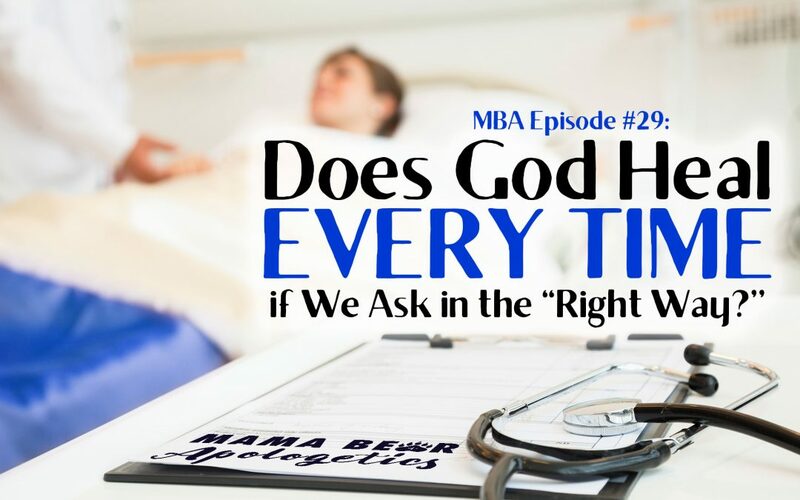 Do you sometimes wonder if bad things happen to you because you “don’t have enough faith?” If you do, chances are, you have heard a sermon or two (or more) based on the “gospel” of health and wealth. God wants you to be healthy! God will heal every time. . . as long as you have enough faith of course. Haven’t been healed yet? Well. . . we’ll all pray that God would reveal the secret sin that you are refusing to confess, so you can be healthy like the rest of us. I remember a few years ago when my body was doing all sorts of strange things. We didn’t know it at the time, but I had cancer. The church John and I were attending had a guest preacher, and it was one of the most offensive sermons I have ever heard. The guy was actually a member of our church, so it was even harder coming from someone I considered a friend. I’d heard about the “health and wealth” gospel, but I’d never had anyone preach it from a church I attended. . . until that day. As a longtime sufferer of chronic kidney disease, and a newfound sufferer of some mysterious ailment, I sat in my seat with tears in my eyes. They weren’t tears of sadness or self-condemnation. No. Mine were tears of anger. Healing is a touchy subject. It is true: Jesus never refused to heal anyone who sincerely asked. The times He didn’t heal, Jesus mentioned that there was an issue with faith. It’s right there in our Bibles. It’s a pretty hard theology to refute just using the Gospels, but if one looks at both the whole of Scripture, and church history, it is clear that the health and wealth gospel is a misunderstanding, and a dangerous one at that. So how should we approach it? 1. Be careful to not confuse hope with promises. When you are dealing with someone who needs healing, you are dealing with someone who desperately needs hope. Unfortunately, some people interpret “hope” by boldly proclaiming over the individual that GOD WILL HEAL!! IT IS WRITTEN! Yes, we are to instill hope. But where does our hope come from? Our hope comes from what God has done (the cross) and what He has promised to do in the future (resurrection, and a restoration of this world.) Nowhere in Scripture does God promise to take away our present afflictions. Books like 1 Peter—predominantly written for people enduring suffering—would make no sense. Look at the New Testament. I can’t count the number of times that it tells us to endure suffering. I’d like to say “Even the Apostles endured suffering,” but that isn’t accurate. It is more accurate to state that the Apostles especially endured suffering! Now we can’t conflate suffering from persecution with suffering from illness. They are too different kinds of suffering. So is Scripture only referring to persecution and not to illness? I would say no, because of the passage in 1 Timothy where Paul is counseling Timothy about what to do for his stomach problems (1 Timothy 5:23). He doesn’t rebuke Timothy for his lack of faith, or failure to pray over the condition. No. He offered practical solutions. 2. We should have faith in what God can do, not what He will do. There is a very big difference between these two statements. Many people condemn themselves for having a “lack of faith” that God will do such and such. They have been told by (often) well-meaning Christians that they cannot have any doubts about God healing them. When they don’t see results, they start wondering if it really is God’s will to heal them. . . and then immediately start beating up on themselves for their lack of faith. And then they start living in fear that even entertaining those thoughts is blocking their healing! Then they feel even more condemned, wondering if their lack of healing is their own fault! And then we have this massive shame-spiral all coming down on a person who is already sick. Friends, please help take this burden off of your fellow brothers and sisters who are suffering. Please point them to Daniel and his friends. Before Daniel, Shadrach, Meshach and Abednego went into the fiery furnace, they declared, “The God we serve is able to deliver us from it, and he will deliver us from Your Majesty’s hand. But even if he does not, we want you to know that we will not serve your gods.” (Daniel 3:17-18) (emphasis mine.) We are not called to predict what God will do. We are called to stand firm in what He can do, and then let Him be God. Children are especially black-and-white thinkers, and this kind of nuance may not be obvious to them. People often behave like they have to choose between confidence and discernment. Do we proudly proclaim things with confidence, and ignore the grey areas of uncertainty, or do we wallow in the grey uncertainties, and not proclaim anything at all? I think that when we have a proper view of Scripture, we can proudly proclaim boldness and victory like Daniel and his friends did, while exercising humility—recognizing that we may not always know the mind of God. When dealing with kids, this kind of reasoning is difficult but important to instill. We cannot and should not tell our kids that God has promised to do something unless we are absolutely positive that He has. Kids don’t forget broken promises. Which brings me to my next point. . . There is a lot more I can say, but I will leave you to the podcast above. Rebekah and I did our best to discuss the important concept with grace, tact, love, confidence, and most importantly, discernment. If you are currently in a state of suffering, either from your own health, or ill-health of a loved one, the Mama Bears stand with you and pray for comfort, boldness, and healing. We rage against disease, knowing that we were not created for such a world as this. And we rage against sin, knowing that it is sin’s corrupting influence in this world that has marred a perfect creation. We boldly proclaim not only that our God is capable but He is willing to heal! We proclaim this with full knowledge that He sometimes chooses not to, for reasons we don’t understand. However, in spite of our sicknesses, and the sicknesses of our loved ones, we have hope, a hope that will be revealed when Christ returns. I hate running, but we are running a race at this very moment. Our bodies are tired, and our legs feel like they will give out. Some people’s races finish earlier than others. We are only responsible for what the Lord has given us, and we run as if to win the prize. The prize is being with our God for eternity, and I wish I could give you a small inkling of what that means. However, “no mind has conceived the things God has prepared for them.” (1 Corinthians 2:9. And most of all, I want the Mama Bears to know that Rebekah and I speak on this podcast not out of theoretical knowledge. We speak from experience, both of us with close family members currently suffering through terminal illness. – It’s dangerous to base God’s faithfulness on whether or not he performs a certain task and that sets people up for unbelief. – separating scripture from its context can make this extreme theology believable so we need to be knowledgeable of what it was Jesus was actually doing and why. – There is always a purpose in the miracles, and no one would know the difference if they were always happening. Why is this important for our Kids? We have to prepare our kids how to view suffering through the Christian worldview so that they aren’t set up to think that God has failed them at the first sign of suffering. Promises are meant for the people they’re given to and we can’t use them as God’s obligation for our lives. We can’t accuse God for not doing what we think He should do. Like Job we have to humble ourselves when we think we know enough to tell God what He should do. So What’s the Balanced Approach? Remember the constant widow (Luke 18) who always came to God asking. He never wants us to stop seeking his healing or encouraging others. His faithfulness doesn’t depend on his obligation to act how we want. There are blessings that can come through suffering. Yes, unfortunately, there are. I think there are some cases where they are absolutely right. If we read through the New Testament, there are sometimes when Jesus heals by speaking healing, and sometimes he heals by rebuking evil spirits. I think we have similar issues nowadays. But for some reason, we as humans are like pendulums, always swinging from one extreme to another. I have found it necessary to recognize that sometimes there is physical healing that needs to take place, and sometimes physical illness is spiritual attack. It really is on a case by case basis though.